Looking for the Local: Architecture and the New Zealand Modern was a photographic survey of New Zealand architecture from the 1950s and 60s, seen through the lens of a unique collection. In the context of contemporary obsessions with ‘modern’ design it is an exhibition which has immediate currency. 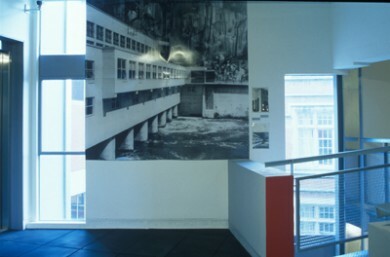 However, more than simply referencing a past era of much general interest today, these photographs are presented in order to re-assess the built forms of post-war New Zealand and to discuss the attitudes and viewpoints which have surrounded this largely overlooked period of New Zealand’s architectural history. The exhibition framed two decades of architectural ambition. While depression and war had displaced a generation of architects and restricted architectural endeavour, what followed was a time of economic growth and optimism. A period marked also by its commitment to the ‘modern’, notions of which had gained currency in New Zealand via global migration, international publication and the return of servicemen from abroad. Architectural debates were, however, as much concerned with the local and the idea of a New Zealand vernacular, as with imported ideas of international modernism. Defining a distinctively New Zealand architecture was a high priority. In architectural quarters, this activity first asserted itself in a proliferation of architectural publications and in the establishment of a number of proactive architectural societies and groups. In 1946, the Architectural Centre was established in Wellington, with the intention of raising the profile of architecture and design in New Zealand. In the late 1950s, a group of architects affiliated with the Architectural Centre, determined to produce and publish a book that would claim a position for New Zealand architecture. The group amassed a large collection of photographs, collected by architects nationwide. Debates regarding the built forms under inquiry and ideas about their constitution were thoroughly discussed. Vying propositions were contested, but ultimately never resolved and the project was abandoned, in part because its contributors were unable to agree about how to suitably define New Zealand architecture. The material traces of the project, now held by the Turnbull Library in Wellington, are the source and substance of the exhibition, Looking for the Local: Architecture and the New Zealand Modern. With retrospective focus the exhibition reconsiders and, for the first time, publicly presents the collected photographs and archived records. In so doing, the exhibition shows both key and relatively unknown buildings of New Zealand modernism. What was made immediately apparent by the exhibition is the scope and diversity of architectural practice in post-war New Zealand. The breadth of the buildings represented by these black and white images highlights the wide ranging manifestations of modernism, which, for example, were not only closely connected to socialist commitments to education and housing but were precipitated also by new urban environments, changing technologies and developments in industry. The exhibition, while visually acknowledging the significance of housing within the canon of New Zealand architectural history, negated the notion that modern New Zealand architecture was simply about housing. Here the built forms of urban, commercial and industrial environments, largely written out of architectural discourse, also had presence. Furthermore, the exhibition raised difficult questions about the heritage and protection of architecture in New Zealand by presenting, in their original state, buildings which have been demolished, altered or are today under threat. In a sense, the exhibition reclaimed that modernism was a significant movement in New Zealand’s architectural history and called for an understanding of the need for preservation. This view was endorsed by the physical design of the exhibition, which is itself invested with principles of both modernism and an archival character. Responding to the neo-modern spaces of the Adam Art Gallery, the placement of the photographs, in sealed mylar bags, embraced the rectangular forms and structured modes of modernism, while self-consciously meeting conservation requirements. The photographs themselves have a strong graphic quality. They are period photographs, some enlarged, but mostly in their original form, as they were sent to the Architectural Centre. The significance of photography in the exhibition, goes beyond mere representation. Photography played an important role in the discourse on modern architecture. It was fundamental to architectural publication and, therefore, to the dissemination of forms and ideologies. In Looking for the Local: Architecture and the New Zealand Modern we are in the unique position of viewing old modern photos of new modern buildings—Kate Griffin. Curated by Paul Walker and Justine Clark. The exhibition was supported by Creative New Zealand, Holmes Consulting, Trustees of the National Library, Hoadley Budge Architects, Craig Craig Moller, School of Architecture – University of Auckland, School of Architecture – Victoria University of Wellington, Athfield Architects, Pete Bossley Architects, Gerald Parsonson: Architect, Aalto Books, Art Deco Trust, Standards New Zealand, City of Napier, Lindley Naismith: Architect and Jane Aimer: Architect, Custance, Architectus: Bowes Clifford Thompson, New Work Studio, Studio of Pacific Architecture, Jonathan Mane-Wheoki, Michael Phanoulas, Sir Miles Warren, and Michael Gould.